A huge 12-feet door sets the stage for the visitor, leading him inside to a luxurious reception. The flooring is done in Kadappa stone and ceramic black tile mosaic. 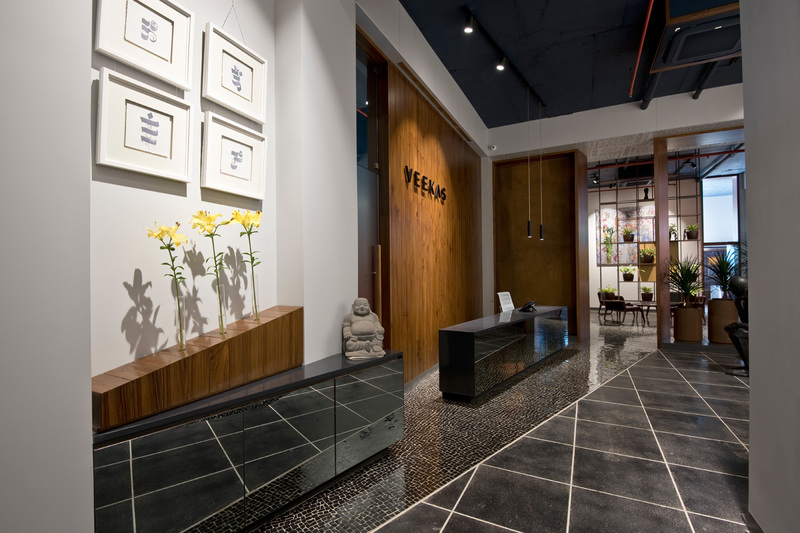 With an enviable experience in architecture and interior design, Veekas Studio needed a new space to reflect their firm’s philosophy and thought process. 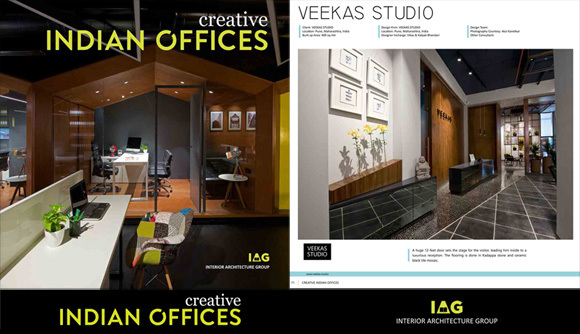 The selected area was a 4200 sqft office space on the ground floor of one of the commercial buildings designed by them. The lavish space was transformed into a comfortable and inspiring work environment with a 14 feet high ceiling and an open layout. Entered via a 12 feet high Corten steel door, the reception and waiting area accommodates a sculpture resembling the ‘thinker’ that is moved often to the bewilderment of the visitors. The space is separated from the executive lounge using a hanging metal framework supporting planters; this does not hinder the visual connectivity and allows for transparency. Three cabins, a conference room and work studios branch out from the lounge, with each given a distinct feel and identity. The colour palette is kept subtle but complemented with vibrant wall art, orange and magenta walls add resonance to the space. 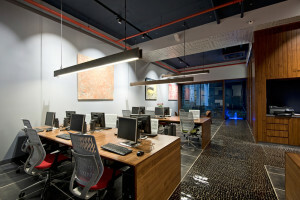 A small water body is incorporated in the plan in conjunction with large windows providing excellent ventilation and making the whole space more conducive to creative thinking.The studio is designed sensitively, keeping in mind the future needs of the growing firm without losing its heritage. Statue of the ‘Thinker’ sits comfortably in the waiting area, suggesting that the studio is always thinking about their clients and their projects. 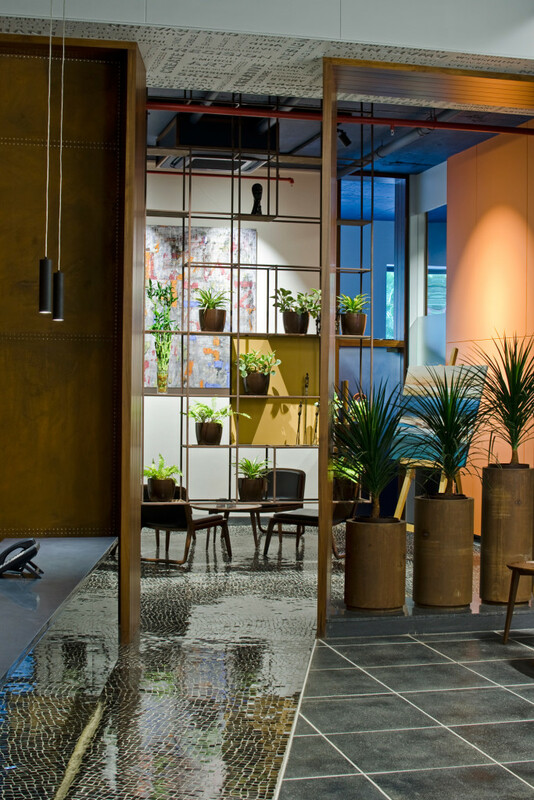 A specially designed planter distinguishes the lounge from the lobby without breaking the flow of the space. The executive lounge features colourful wall art and an orange wall that breaks the muted tone of the interiors. The cabins are each given a different language and colour scheme. Where one features grey walls, the other uses ropes as a ceiling element. 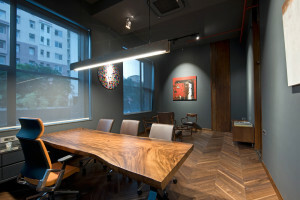 Wooden flooring adds sophistication to the look. 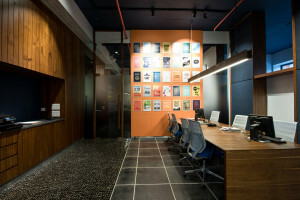 Whimsically called the ‘ Design factory’, the design studio features an orange wall with motivational sayings pegged onto it. The dark blue library units on the adjacent wall act as pin up boards, sliding panels and acoustic units. A break out sitting space is provided for relaxation and discussion. 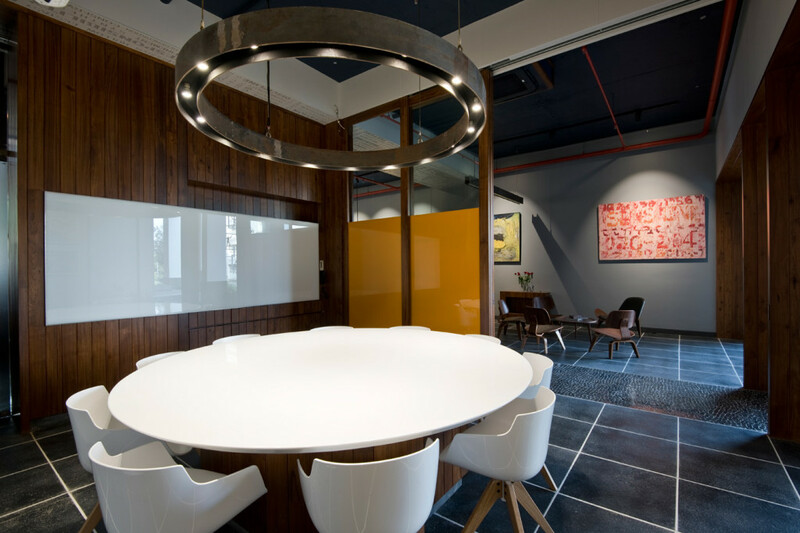 Also called ‘Collaborate’, the conference room has a 10 seater table and state-of-the-art technology. 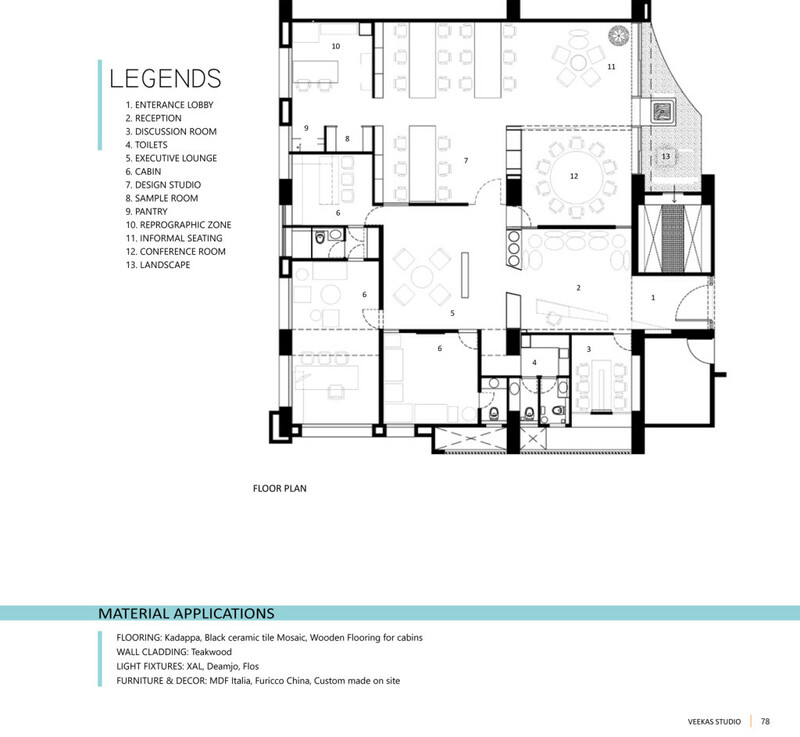 The space can be doubled by opening the sliding door between the studio and the conference room.